Happy New Year, dear readers! I am so grateful to all of you who visit and spend some of your time perusing the blog. I can’t believe that Neen’s Notes celebrates its SIXTH birthday this year. Here’s to another year of sharing and cooking wonderful things together. Like many, I find myself reflecting at the start of a new year on the goals I did or didn’t accomplish, what brought joy or sadness, and even how I changed on a physical and spiritual level. 2013 forced me to re-evaluate myself in the deepest, most raw way. Losing the “definition” of who I was when I lost my job forced me to acknowledge that I was defining me by an occupation that could change at any moment. Gently, I let it tug me toward finally making the leap to start yoga teacher training, let myself go deeper and find a better sense of self and how I connect and interact with everything and everyone else. And I guess it’s pretty obvious that it has been a powerful and eye-opening experience thus far. 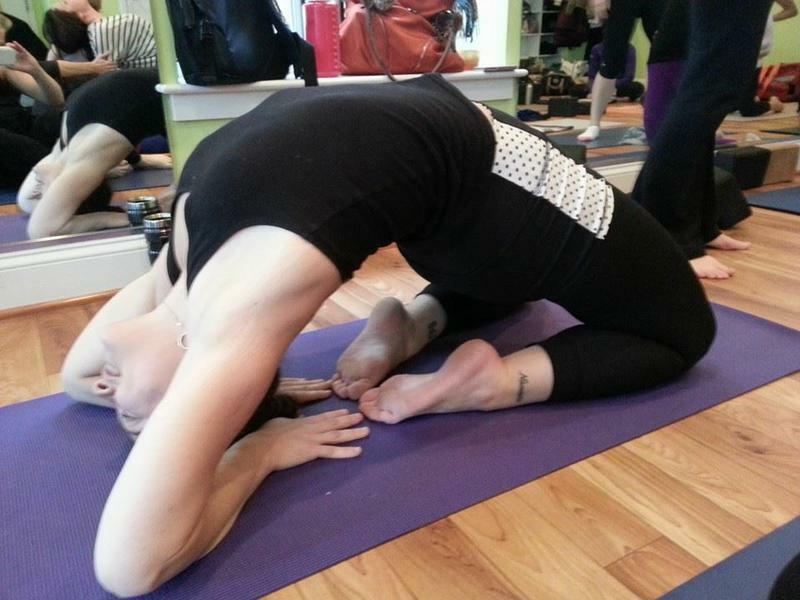 I enter 2014 stronger, more flexible (in mind and body), and eager to learn. Though I don’t make new year’s resolutions, a general mantra of adding more good to life and causing less harm overall has been at the forefront of my mind. And for me, part of causing less harm and adding more good to my culinary life means less meat and more plants. Even as a conscious omnivore who sources animal proteins from local, sustainable sources as best she can, I can’t deny that eating animal protein is an indulgent choice. It has a greater impact on the environment, is less economical than producing plant protein, and is cruelty toward a sentient being. So rather than beat myself up for not going full vegetarian or vegan, I’m simply focused on adding more good to life, learning more plant-based recipes and techniques, and eating more plant-based meals. Taking and wasting less overall is something that would make me feel like a better citizen of the planet. And of course, anything worth cooking is worth making delicious. This week, I’m sharing a soup that hits all the right notes: It’s creamy, comforting, rich, and earthy, is loaded with health benefits and cleansing ingredients, and is free of most common allergens (gluten, nuts, and dairy). It might not cure whatever influenza plague seems to cling to most cities in the winter months, but I’d call this the best tasting preventative medicine I’ve ever had. 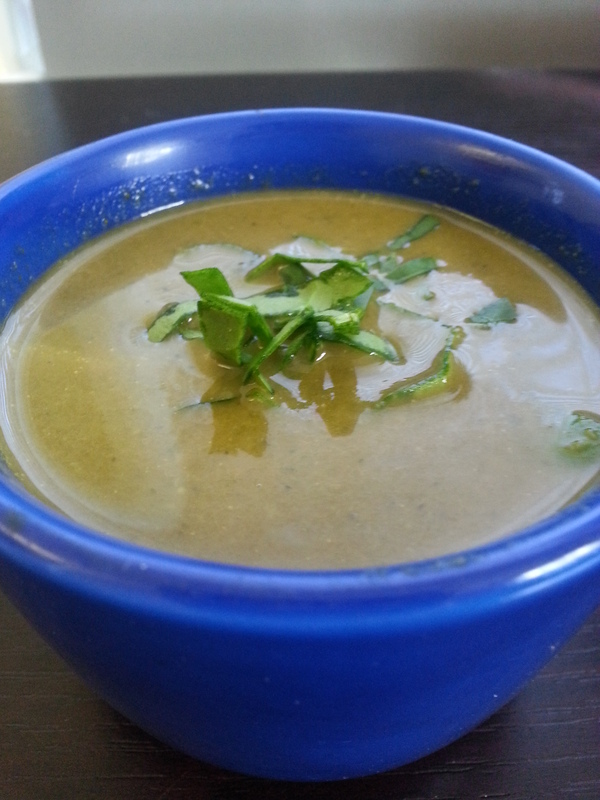 I loved cream of broccoli soup growing up, but always bogged down with milk and cheese. Nothing quite like a rich, salty, cheesy bisque surrounding little florets of broccoli. And while there’s nothing wrong with fat in your diet, I thought “we can do better!” Let’s give the body a break–digesting dairy is difficult. In fact, a whole lot of people lack the lactase enzyme almost entirely. Instead, our friend light coconut milk comes in here and brings the creaminess to the party, while simultaneously raising HDL levels and helping improve the blood cholesterol profile. Broccoli helps to modulate the body’s immune response because it’s loaded with vitamin c and and iron, and the addition of spinach brings even more iron, vitamin a, folate, b vitamins, calcium, potassium, and omega-3 fatty acids (talk about a super-food). Ginger adds a special spiciness to the blend, and can also soothe an upset stomach and act as a mild anticoagulant and improve blood circulation. Finally, the soup is simmered with a piece of kombu, an edible sea vegetable that contains a large amount of glutamic acid, which brings that savory, umami taste to the pot. 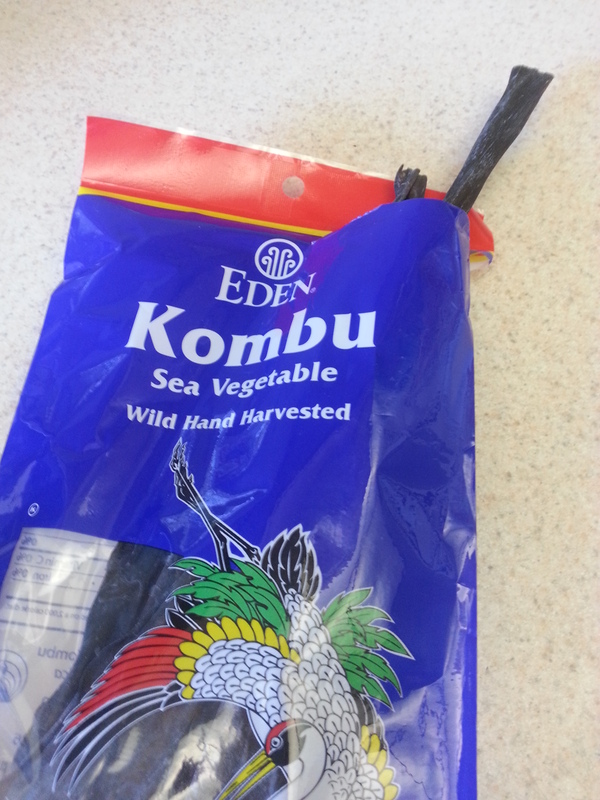 Kombu is a great way to achieve an earthy flavor and body in soups without adding animal protein. It’s also rich in iodine that helps regulate the thyroid, which in turn, helps you stay hormonally balanced and healthy. Why aren’t you eating this yet?? Heat the olive oil in a large pot over medium heat. 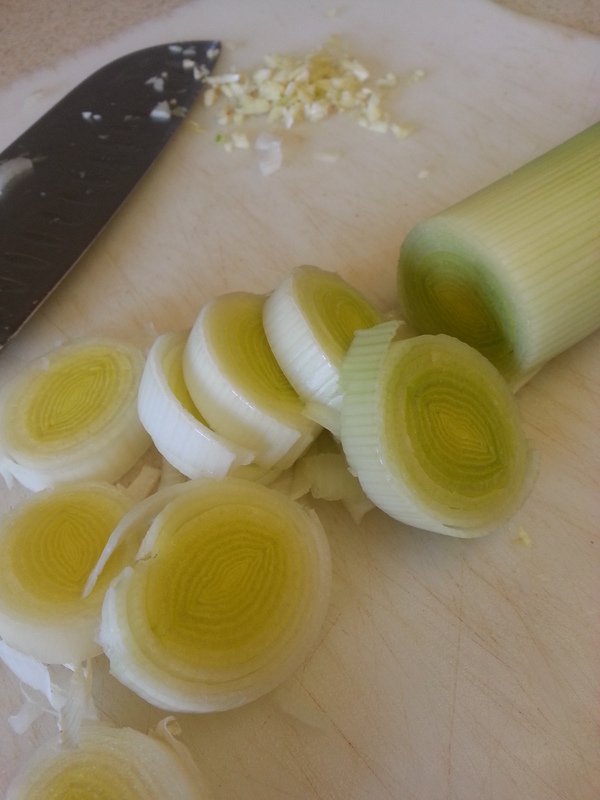 Add the chopped onion and leek to the pan and cook until mostly translucent, but not browned, 5-7 minutes. 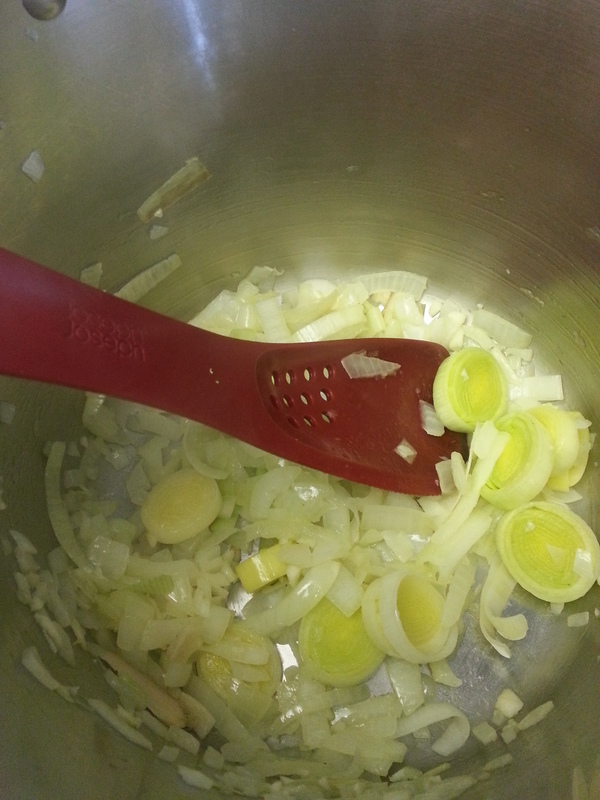 Add the ginger and garlic and cook one minute more. 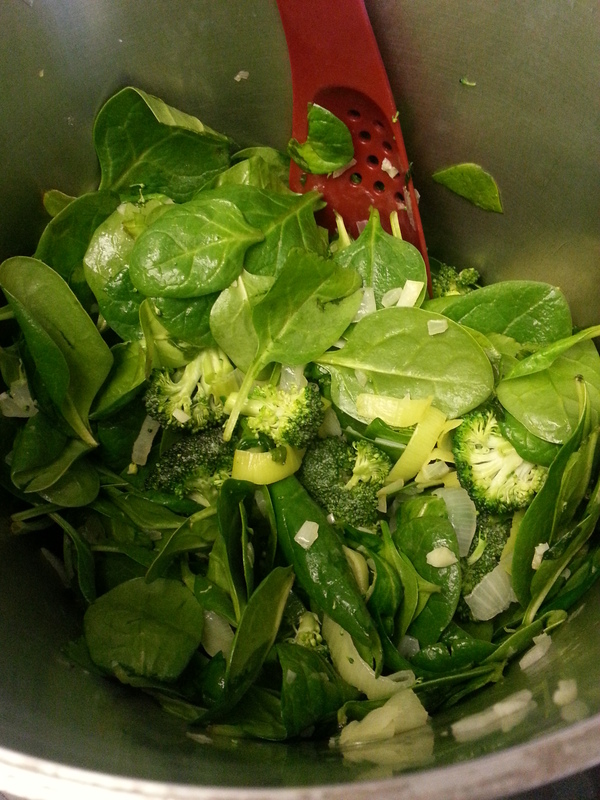 Add the spinach and broccoli to the pot and mix well. Add the broth and spices, raise the heat to high and allow the soup to come to a boil. Once it is boiling, reduce the heat to a simmer. 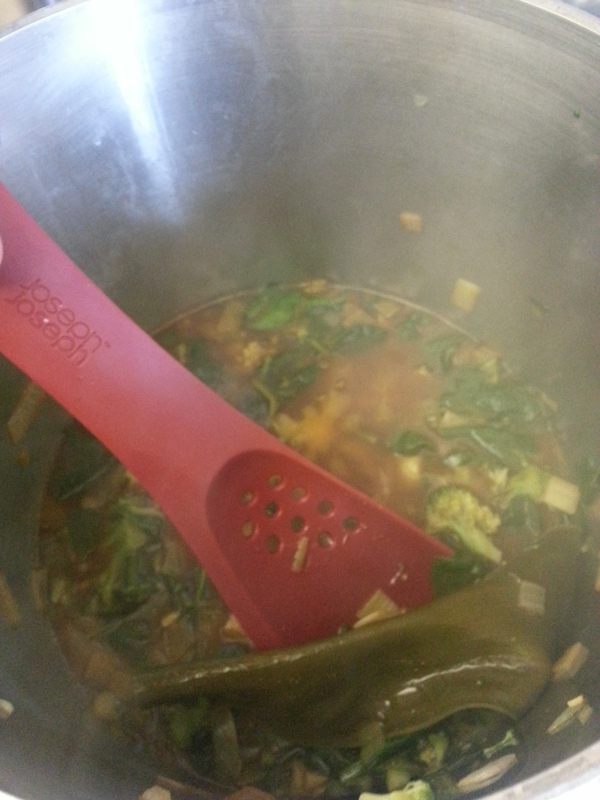 Add the kombu to the pot and simmer until the broccoli is tender, about 10-15 minutes. 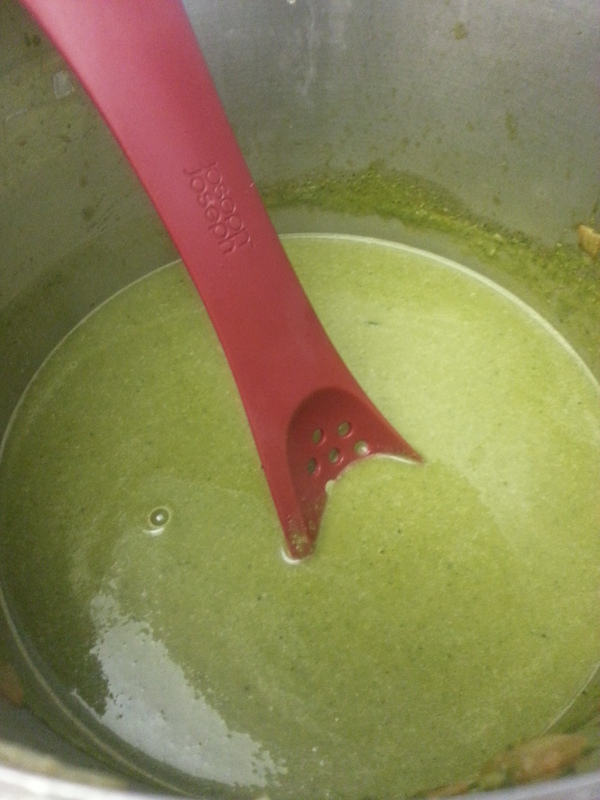 Remove the pot from the heat, discard the stick of kombu, and puree the soup in a blender (working in batches to avoid splatters), or using an immersion blender. 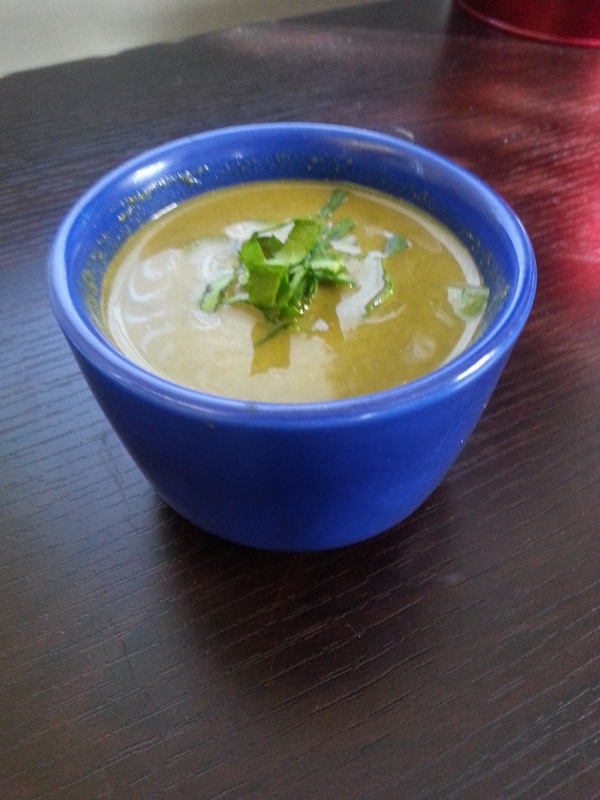 Add the coconut milk and return the soup to the stove over low heat. Season with salt and pepper to taste. Serve hot, garnished with fresh herbs. Treating yourself to this soup is a gift in so many ways. Not only does it taste rich and velvety, it feels like it was meant for comfort on a cold winter day, and all those health benefits are a present for your body. And because it’s free of animal products, gluten, and nuts, it’s something you can share with a great majority of folks. And you know, I think food almost always tastes better when shared.